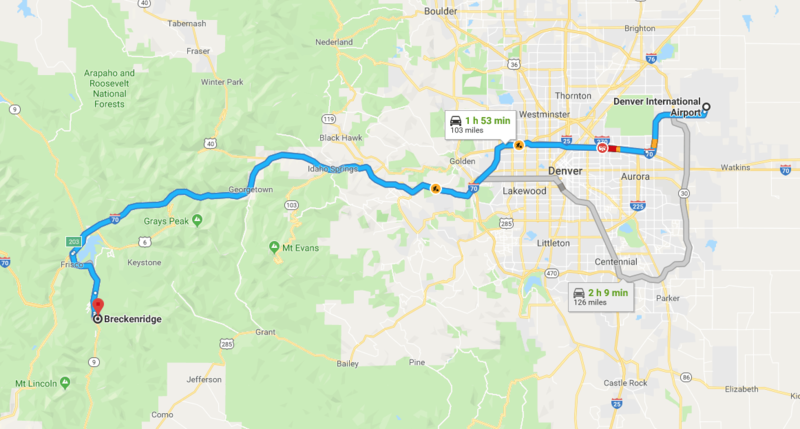 As you make plans to travel to Breckenridge, Colorado the first thing you may realize is how far away the Denver airport is from your final destination. There are many ways to arrive safely at your destination. I personally prefer to let others do the driving. There are several options for airport shuttles from DIA to Breckenridge. I have listed the top 5 options for travel to Breckenridge below. Check them out! Peak 1 Express offers airport shuttles between DIA and all Summit County locations, including Breckenridge, Copper Mountain and Keystone. Guests may choose from door-to-door service or their great special $54 anytime to or from the Frisco Transfer Station or $59 to or from the Breckenridge Transfer Station. Peak They also provide charters and private SUV’s. Summit Express offers Luxury SUV (Summit Express First) and hourly shuttles from the Denver International Airport to Breckenridge and surrounding areas like Keystone and Copper Mountain. It is advised you make reservations well in advance of your trip as availability is limited. Epic Mountain Express provides professional, timely and competitively-priced rates and top-notch guest service. Shuttle service is offered in Ford passenger vans that are equipped with free Wi-Fi to and from Breck from Denver Int’l Airport, and CME also provides door-to-door service to surrounding towns as well as downtown Denver. For rates and schedules, or to book a pick-up. Black Mountain Limo is another viable option as well. They offer high end luxury rides from DIA to Breckenridge. They operate luxury Suburban’s and new this year is a state of the art Expedition. They also offer inter-mountain services in the event you would like to visit other ski areas in the region. The most common mode of transportation to Breckenridge is renting a car. This option does allow for more freedom of schedule, however if your visiting in the winter time the drive can be downright dangerous if you are not an experienced driver in the snow. Parking cost is high, and availability is low. Breckenridge is pedestrian friendly, and the free shuttles make getting around very easy. Finally, the most economical way to get to Breckenridge From DIA is to take the commuter train from DIA to union station and catch the Bustang. This bus will take you to the Frisco transfer station, from there you would catch the Summit Stage to Breckenridge. Although economical it does require advanced planning as it has only one departure per day going to and returning from Summit County. Once you have arrived getting around in Breckenridge and Summit County is easy using the free Summit Stage, which goes all over Summit County. The swan mountain flyer will get you to Keystone and Arapahoe Basin. The Breck Free Ride makes it easy to get around in the town of Breckenridge. The Free Ride is a free shuttle service that connects the Breckenridge Ski Resort with parking areas and makes several stops along the town’s perimeter. Visit their website to see a map of their route.